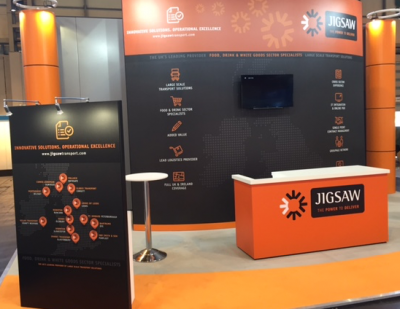 Our client, Jigsaw Transport, was again highly complimentary of the 50m sq stand we designed, built and support-hosted at the NEC last week. The three-day exhibition – aimed at decision makers in the transport industry – provided the perfect proving ground for our client to showcase their unique transport solutions. Known for our excellent barista skills, we managed to attract a number of influential existing as well as prospective customers onto our clients stand. “Purple did it again. We arrived in time for the opening on the first day to find an impressive stand, fully stocked and ready to go. Having worked with Purple for a number of years, I know I can leave them to come up with the goods, from stand design & build, to giveaways and manning schedules, they have it all covered with great attention to detail. This year’s stand outshone all previous and we attracted some very interesting people, so all round a huge success!” Andy Humpherson, MD, Jigsaw Transport. New Account Exec at Purple Another win at MT Awards!